My favorite snack pack pudding flavor combo was s’mores. Hands down. I mean, I’ve always loved the s’mores rendition of most snacks. 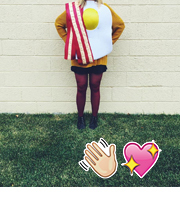 (Pop Tarts too!) So I figured this pudding HAD to happen. And while I’m at it, why not freeze the hell out of it pop-style!? I wanted to go all out for Billy’s Popsicle Week, ya know? P.S. Click that little popsicle week image to see the list of bloggers and flava flaves of pops happening this week! I loved having those little snack pack pudding guys in my lunch back when I was in school! The only time I wasn’t into them was when I’d get soup, apple sauce, AND pudding. I mean, if I’m not chewing, it’s not a meal, ya know? 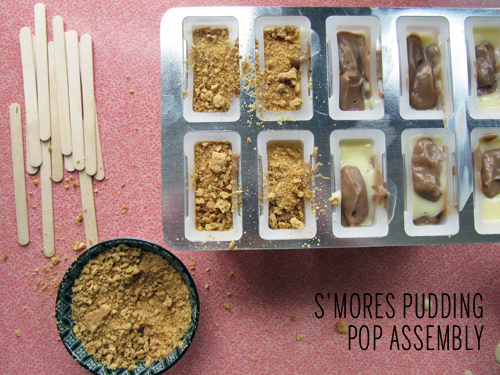 Anyhow, I just want to say that these s’mores pudding pops are half milk chocolate and half toasted marshmallow pudding. They freeze up all awesome-like and taste like those snack packs of my childhood! Do it up! Pop, lock, and drop it like it’s hot. Whisk your feelings! Then freeze them! * Toast marshmallows using an oven torch or pop them under the broiler in an oven-safe dish until toasty and melted. Melt the milk chocolate and toasted marshmallows in separate medium bowls in the microwave for 20 second intervals. Set aside. Whisking constantly, cook over medium-high heat until the mixture thickens and bubbles start to form and sputter; about 6 minutes. It’ll thicken JUST when you think it should’ve already. Once it’s thick and luxurious reduce heat to low and continue to cook, whisking constantly for 1 minute. Remove from heat and whisk in the vanilla. Divide the pudding, evenly between the bowls of melted milk chocolate and toasty marshmallows. Whisk quickly to incorporate the goodness. 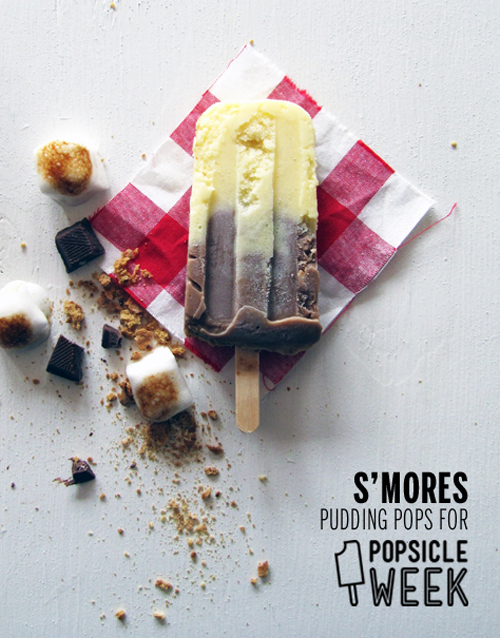 Spoon the milk chocolate pudding and toasted marshmallow pudding alternately into your popsicle mold. Sprinkle the ends with graham crackers and insert sticks. Freeze for 6 hours or until super firm. Remove from pop molds by running them under warm water. 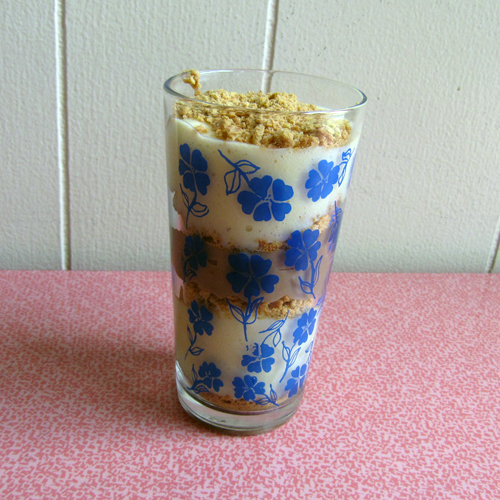 Dunk in graham cracker crumbs and serve! Lightly spray a 9×13 inch pan with cooking spray. Bloom gelatin in 2/3 cup of cold water for 10 minutes. Meanwhile heat the remaining 1/2 cup of water and sugar together until it boils. Allow to boil for 1 minute. Add bloomed gelatin and stir until mixed. Beat with an electric miser until lightened in color and voluminous. Mix in the vanilla extract. Spread into prepared pan and dust with powdered sugar. Allow to set for several hours before cutting and rolling each piece in a mixture of cornstarch and powdered sugar. Use half for the pudding. 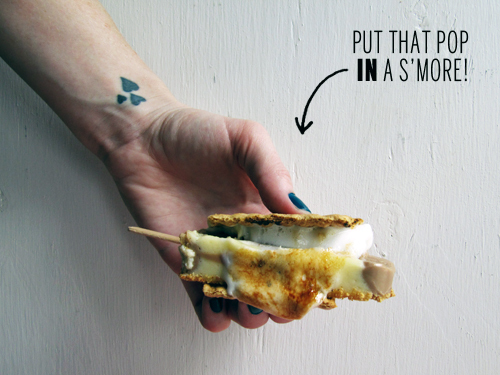 Use the other half for s’mores! 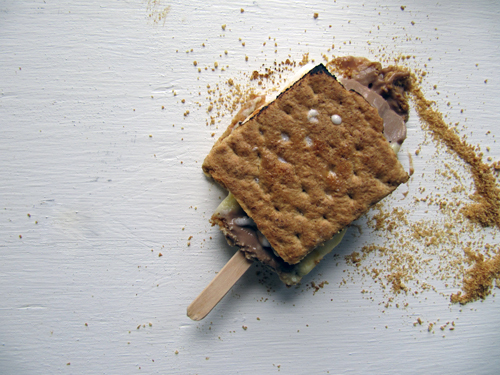 S’mores pop s’more. Doubz troubz. Oh lawd. Toasted marshmallow popsicles! I want it to be popsicle week erry week. You got them pops on lock. Yes! Let’s make every single week popsicle week. hell yes! I’m so into that toasted marshmallow pudding layer! and way to make 2 treats with 1 recipe! 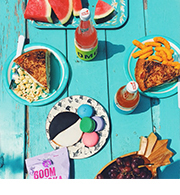 Pop and parfait the day away! uh YES!! These things incredible and down right delicious!! I love the layers and all those graham crackers crumbs. S’more everything rules! Thanks! I love s’mores too much maybe! I’m all over these yo.. and that put the pop in a s’more action is serious biznaz! It’s a frozen and toasty dream! There are no words to describe the awesomeness my eyeballs are experiencing right now. Seriously. Weeping with joy right now! This is just insane. Awesomely insane. I love all things s’mores. Especially those danged pop tarts. Like for reals. Thanks, Lauren! Yeah man, those pop tarts! Can’t handle it. These are AMAZING my face off right now. I want like three, for breakfast. Bravo friend! These are the times when I think you can’t possibly be human, but someone sent from another dimension to master and share the tastiest treats in the world. I can’t believe you s’mores-ed that pop! YES! !!!!HWLIHDLINDLIEHLIENDLIHDLIS:OJD:KJDLIHERLKWE:W:OSJ:ODOJD. THAT IS ALL I CAN TYPE. Question: do you have to somehow toast the marshmallows after you make the marshmallow recipe? The title is Easy Breezy Vanilla Marshmallows, but then the puddling pop recipe says 1/2 batch marshmallows, toasted. Not sure if this just means the marshmallows as they are when you make them, or if you’re supposed to toast them? Thanks! These look amazing! Simply toast a half batch of marshmallows using an oven torch OR put them in an oven-safe dish and pop them in the broiler until toasty and melted. Hope this helps! Marshmallows! Pudding! Popsicles! Oh! My! Goodness! 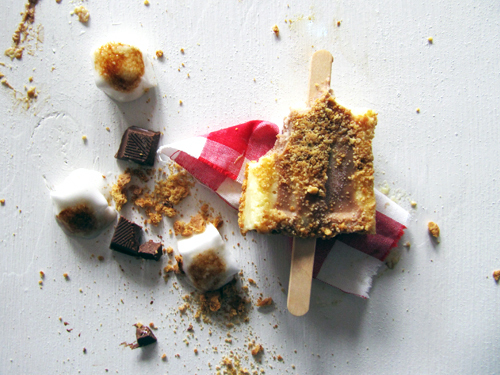 Also s’more pop s’more – That’s dessert inception. and I’m all for it. Oh. Mahgoodness. Can I play favorites and say I love yours best?? I really, really, really want to eat this. I am totally crushing on the flava flavs of this pop! And putting the s’mores pop in a s’mores sandwich? LAWD. Thanks, Stephanie! S’more s’mores, please! But seriously, YES. You’re making me crave all the s’more things! Including s’mores pop tarts. Best ever. 6 Homemade Popsicle Recipes For Your Spring Sweet Tooth | Everyfoodrecipes, cooking tips, and how-to food videos—all rated and reviewed by millions of home cooks,make the perfect birthday cake, or plan your next holiday dinner.